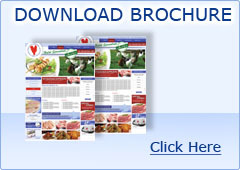 We are leading independent Fully EEC licenced, MHS approved and HACCP controlled Chicken Cutting Plant , specialising in supplying fresh halal chicken to the Take Away, Catering and Restaurant Industries. We pride ourselves on providing a personal service, quality food products, reliability and value for money on all of our fantastic high quality frozen and fresh food products. The HACCP system that we employ is at the heart of our production facility. The HACCP system ensures that all the products remain within thier assigned limits and have full traceability from arrival and to the delivery of the products as well as removing the chance of cross-contamination. We efficiently supply our customers with our specially chosen quality fresh halal food products and provide competitive prices. 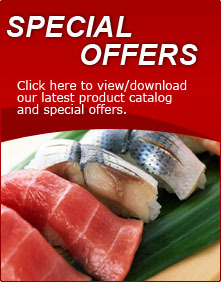 Once your order has been made it never takes longer than 24 hours to reach your door! 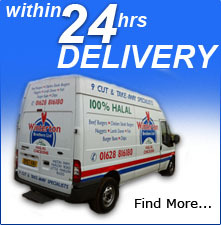 And we even offer a Same Day Delivery Service. We are proud of our high quality service and foods including Halal Meats, Halal Chicken, Buns, Chips, Doners, Fresh boneless, Liver, Whole Chickens, Legs, Fish. 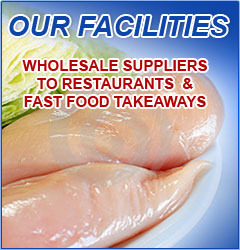 Unlike other Chicken Wholesalers we cater for all tastes and provide a wide variety of fresh chicken and frozen products to suit unique tastes as a result we have developed a varied customer across all areas of the food industry. Please take the time to look through our website if you require any more details you can contact us on 01628816180 or if you prefer you can contact us using our online contact form, all of our product prices are available on request.